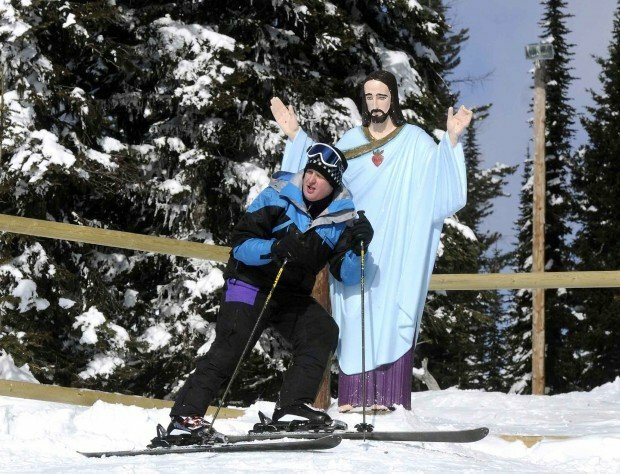 Lyle Burke of Alberta, Canada, poses with a statue of Jesus Christ near the top of Chair 2 at Whitefish Mountain Resort on Sunday afternoon. Passersby have visited and had their photos taken with the statue since it was first installed in 1955 as a tribute to war veterans. The statue of Jesus Christ at Whitefish Mountain Resort overlooks Whitefish Lake and the Flathead Valley. The Knights of Columbus from St. Matthews in Kalispell maintain the statue. WHITEFISH - A statue of Jesus Christ that faces eviction from a small tract of U.S. Forest Service land on Big Mountain could acquire a new landlord under draft legislation introduced Monday by U.S. Rep. Denny Rehberg. Under the congressman's proposed land swap, possession of the 25-by-25 foot land parcel would shift from the Flathead National Forest to Whitefish Mountain Resort. In exchange, the resort would offer a different land parcel of similar size and value. Controversy surrounding the statue began last month when the Flathead Forest declined to renew a lease permit that has allowed the statue to occupy a chunk of land along a ski run at Big Mountain since 1955. The decision prompted outcry from proponents of the stone statue who regard it as a historic monument. The statue was installed by a local chapter of the Knights of Columbus to honor World War II veterans and members of the Army's 10th Mountain Division. Flathead National Forest Supervisor Chip Weber has withdrawn the decision not to renew the lease, and the statue is being reviewed for possible inclusion on the National Register of Historic Places. Forest Service officials on Monday also announced the beginning of a 30-day public comment period to reauthorize the special use permit for the Knights of Columbus. The reauthorization would render Rehberg's proposed legislation moot and the permit would be granted for another 10 years. "I certainly hope the Forest Service will respect the wishes of just about everyone in the local community, but if they decide to fold to out-of-state lawyers, it's important to have an ace in the hole," Rehberg stated in an announcement posted to his website, www.veteransjesus.com. The Republican congressman was referring to "out-of-state lawyers" from the Wisconsin-based Freedom from Religion Foundation, a national atheist organization that has taken credit for the U.S. Forest Service's decision not to renew the permit. Managers at Whitefish Mountain Resort have said they do not want to see the statue removed because it is part of the ski area's heritage. The statue is located near the top of Chair 2 within the Whitefish Mountain Resort permit boundary, and is a local curiosity for skiers who pass by. Forest Service officials have said threats of litigation from the Freedom from Religion Foundation did not influence the decision. In accordance with the National Environmental Policy Act, the Flathead Forest said the comment period will run through Dec. 8 and "provides those interested in, or affected by, this proposal an opportunity to make their concerns known prior to a decision being made." The Forest Service has determined, and the Montana State Historic Preservation Office has concurred, that the statue is eligible for listing in the National Register of Historic Places due to its historic association with the early development of the Big Mountain ski area. Comments should be written and sent by email, mail or fax. Comments in PDF, Microsoft Word, Word Perfect or RTF formats can be emailed to: comments-northern-flathead-tally-lake@fs.fed.us. The subject line of comments should read "Knights of Columbus Special Use Permit Reauthorization Project." Mailed and faxed comments should be addressed to Project Leader Derek Milner, Tally Lake Ranger District, 650 Wolfpack Way, Kalispell, MT, 59901; fax to (406) 758-5367. The office business hours for those submitting hand-delivered comments are 8:00 a.m. to 4:30 p.m., Monday through Friday, excluding holidays. After the close of the comment period, a decision memo will be available online at www.fs.usda.gov/goto/flathead/projects. Reporter Tristan Scott can be reached at (406) 730-1067 or at tscott@missoulian.com. WHITEFISH - Having made cameo appearances in taco shells and coffee splotches, it should come as little surprise that Jesus - or his likeness - would alight on Big Mountain. 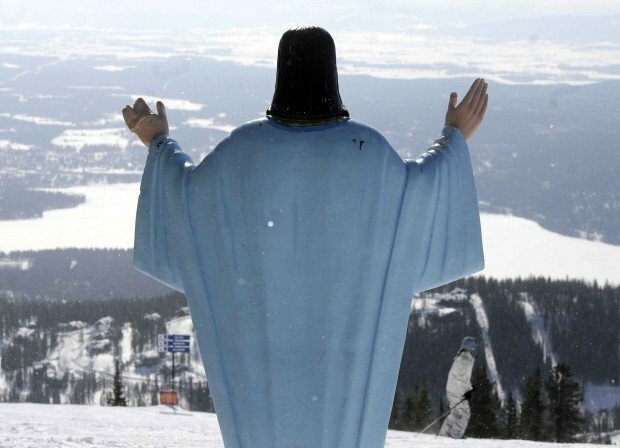 Still, skiers and snowboarders have been known to pinch themselves when they round the bend at the top of Whitefish Mountain Resort's Chair 2 and, through a miasma of snow and fog, glimpse the statue of Jesus Christ. WHITEFISH - An uncertain future lies ahead for Big Mountain's most iconic luminary: Jesus. The painted stone statue of Jesus Christ stands at the top of Whitefish Mountain Resort's Chair 2 and has graced the mountain for almost 60 years, paying homage to local veterans of World War II who encountered religious shrines in the remote mountain communities of northern Italy.